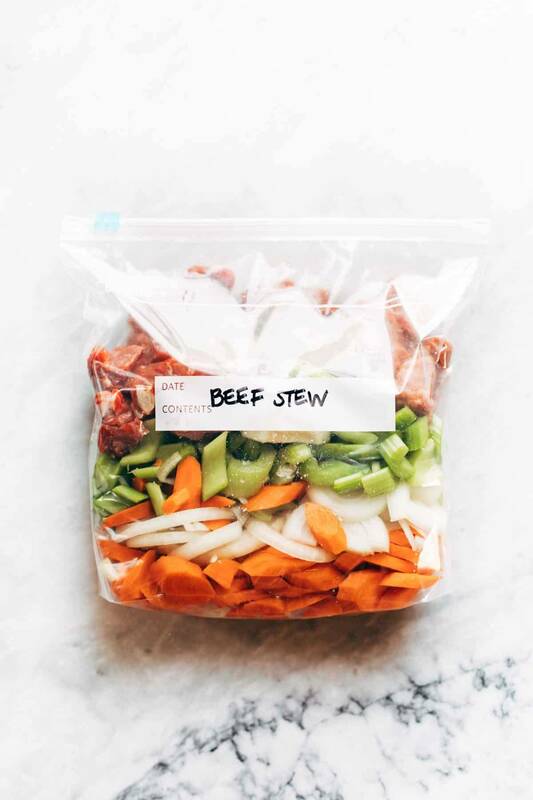 Is there really anything better than pulling a ready-to-go Freezer Meal Beef Stew out of the freezer on a cold winter night and having dinner ready in just over an hour? I THINK NOT. Oh, wait, yes there is – it’s that same situation + a piece of crusty bread for dunking into the stew, and a good TV show to catch up on, and a pair of really comfy sweatpants. There it is. That’s the dream right there. I am not a huge beef eater, but I really, really, really love this recipe. It couldn’t be easier and it freezes perfectly, not to mention cooks up in a flash if you’re using the Instant Pot. It’s saucy, savory, and texturally somewhere between a soup and a thick gravy, like a good stew should be. Okay, first, I recommend using fresh veggies for this recipe. You want your veggies to have that nice diagonal cut to them, so slice them up and toss them into a freezer container with your beef, salt, sugar, and tomato juice. 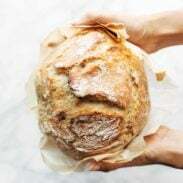 When you’re ready to make this beauty, just take it out of the freezer and transfer it to your Instant Pot. After it’s done cooking (which happens remarkably fast), add a little cornstarch slurry to get it thickened up a bit. And there it is. 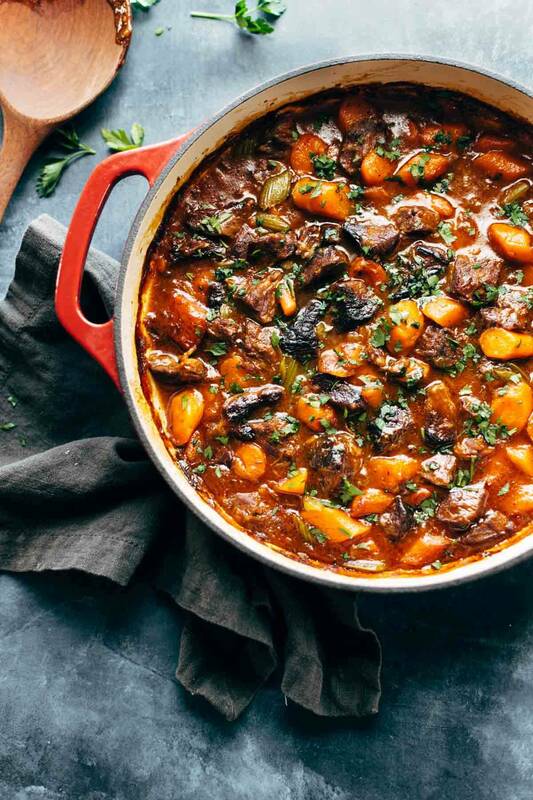 The easy, ridiculously delicious, Freezer Meal Beef Stew of your dreams! Freezer Meal Beef Stew! Served with crusty bread and a green salad? YES. just 6 ingredients, 45 minutes, and done. SLOW COOKER: From thawed, 5-6 hours on high. Lindsay, where does all the sodium come from? I would love to make this but alas the mean ol doctors have restricted my salt intake. Any suggestions for reducing that 1137.2 mg of sodium? Hey Bob, I know you didn’t ask me, but to reduce the salt, get salt-free tomato juice. The regular stuff is packed with salt, and likely is where the bulk of the sodium is coming from (aside from the 2 tsp of salt, of course). Good luck with reducing your sodium intake! thank you! also- can i add any potatoes to this? You can, but raw potatoes don’t freeze super great! I’d maybe add them when you go to cook it. This stew was perfect! My wife and I just had a baby and we froze this meal ahead of time. We followed the directions for the instant pot and it was exactly what we needed. Thanks so much! This stew was perfect! My wife and I just had a baby and we froze this meal ahead of time. Do you need to add any additional liquid or literally just put the frozen contents in and away you go? So I made your Life Changing Beef Stew last night and looking at this recipe today have noticed that the amount of some ingredients are different. In this recipe there is more celery and more tomato juice. Is there a reason for this? Thank you! Hi, looks wonderful! 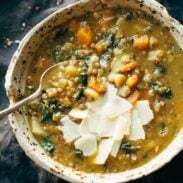 Do you know if adding barley in place of potatoes would be a better option for freezing? Just FYI when you use the ingredient multiplier on these recipes there seems to be a big. It doesn’t multiple the first ingredient of each section.